1. When we were at my high school reunion, we met up with some friends and one of them was telling me all about Chicago hot dogs. Spicy peppers, pickles, relish, and tomatoes? Many of my favorite things. So when we were in Chicago recently, I made it a point to pick one up at Portillo's. It did not disappoint. I was an instant fan! I think I could've eaten a second. Love. 2. When I went to my high school reunion, Pierce asked what that thing was on my shoe. I said, "What thing?". He said, "That thing!" and pointed to the small heel. Turns out my 6 year old had never seen me in heels. I guess I'm more of a flip flop girl. 3. When I was growing up and we would drive up to Maine or something, whoever sat in the front seat was in charge of giving the driver money for tolls. So we'd have a big container of quarters for the tolls. Now? Those tolls are crazy expensive. One day we spent something like $45 in tolls! Talk about highway robbery. 4. I chew a lot of gum. Typically spearmint or peppermint. 5. Having a hard time thinking of a 5th random thing today. Do you suppose Nancy, from A Rural Journal, who hosts Random Friday, would give me the boot if I didn't have a #5 this time? Somehow, I think she'd let it slide, just this once. Well Lisa I am not sure that Nancy is a stickler for details:) not really she is a sweetheart and four is good. The dog looks wonderful. I bet is was delicious! Isn't it interesting how society changes??? It's cute - that your little people would notice things on your shoes. Hot Dogs??? Yes, when it Chicago, it's a MUST. I don't even like hot dogs or most of the things on it and I still want one...it looks that good. Maine tolls are crazy aren't they? When I lived on the coast of NH we would drive an hour up to Portland, ME and it would cost us $7.00 in tolls! I miss hot dogs like this one, (France not a good place 4 HD's), that is very very funny about the heels, glad you had a good reunion, and we pay exhorbitant toll fees here but there are cheaper no toll routes but they add a great deal of time to already long trips. Glad you had fun at your reunion. Next year will 15 years for my class. I hope to make it home for the reunion. I am a big gum chewer too. I like bubble gum and chase it with fresh breath gum. 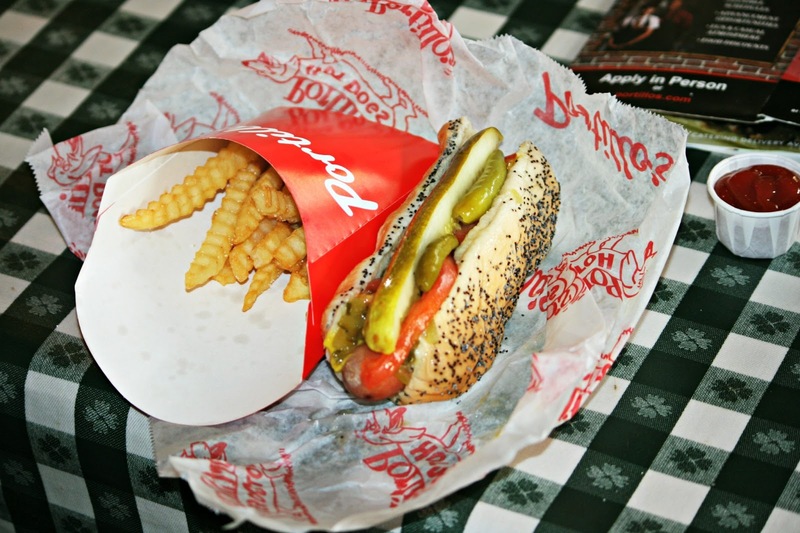 Have never eaten a Chicago style hot dog, but would certainly give it a try. Funny above the heels on your shoes...Have a great Friday. Love the shoe story! LOL! the heel thing was funny. that would be me these days, for sure. i LOVE chicago style hot dogs! every so often, i break down and go to sonic and get one there. i know it's not nearly as good as 'the real thing' but it works to quell the craving. I would love to try that hot dog! That is so cute about Pierce and your high heels. I thought the only shoes you ever wore were Asics Gel's?? Pickles on a hot dog? Not me! That hot dog does look good. I think my husband would love one with spicy peppers on it. Usually if I have a pack of gum near me, I will chew it all up in a matter of a few hours. Especially if it's bubble gum, which I chew as a treat occasionally. I chew one piece after another. It's addicting! i am cracking up over number 2 and i agree, those hot dogs are awesome! those fries look good too...did you try an italian beef while you were there? ohhhh, those are even better than the hot dogs! i chew a lot of mint gum too...it helps me to not want to snack! Glad you enjoyed your Chicago Hot Dog. Portillo's make a great one. Next time you need to try a combo at Portillo's which is Italian Beef and Italian Sausage combined. You won't believe this but there is actually a Portillo's here in California about 30 minutes from our house! Gotta take the backroads and avoid the tolls. Lots more scenery when you do that anyway... enjoy the trip not just the ending. Tolls are ridiculous! We just went from Michigan to Chicago and spent a small fortune on them. We used to do a lot of work in FL. Those tolls killed me!! Too funny about the heels! I love Chicago Dogs ... yum! I chew Double Bubble during college baseball season. ;) Fun post. That hotdog does look yummy! Can you believe i hadn't gone on a toll road until I was in grad school? Around Nebrasaka they don't have too many toll roads. That is indeed highway robbery. I mean, for goodness sake! I am laughing right out loud at the heels story!! A good hot dog hits the spot sometimes. Chicago hot dogs. I'd never heard of them. Something learned for Saturday! Thanks. I think I'd be more of a coney island dog person mainly because I can't eat spicy. But, I'm glad you enjoyed yours; looks good! Sure, I bet Nancy will let you slide by without #5 since the other four were outstanding and made up for the missing one. That hot dog looks yummy! They serve a Chicago dog at Sonic and it looks just like that. I prefer the New York dog from Sonic (that's the way I travel the world - via food from Sonic! LOL). My Hubs loves hot dogs with all kinds of crazy things on them... I think he has even tried the Chicago Hot Dog. Nice to hear you use to get up here to New England :) I know tolls add up quick! Kids never miss new things! I don't wear heels often, except for church and I feel totally off-balance when I do. I think a man invented those things. I've never been to Washington, but many moons ago, Chicago was our plane change when flying home to Arkansas from North Dakota or Canada. Hahaha. What's that thing on your shoe? Too cute. Try the beef sandwiches at Portillos too. I live in Chicago and Chicago Style hot dogs are everywhere, needless to say. :) We are also known for our beef sandwiches and pizza too. Let me know when you are in Chicago again. Love to meet ya!